Mayer Amschel Rothschild, founder of the Rothschild banking dynasty, is said to have declared: “Permit me to issue and control the money of a nation, and I care not who makes the laws”. The implication is that parliaments can talk about laws or indeed change them, but the real power in a country or a city lies with whoever controls the money. Everything flows from this. The story of Rothschild’s ascent from the closed, embattled, ghetto – the Judengasse of Frankfurt – to the seats of power in London, Paris and Madrid is one of the most fantastic entrepreneurial odysseys imaginable. His ability, courage and daring were extraordinary and he took advantage of exceptional circumstances and world-shattering events. His impulsiveness, added to luck and an appreciation of the tectonic shifts taking place in the global economy from 1780 together with an understanding of the power and autonomy of money, underpinned Rothschild’s success; he who controls the money, controls the game. The corollary is also true: without control over money, it doesn’t matter how much you talk or dream of improvements, or how many grand designs you may imagine, because nothing will come of it when you don’t have financial sovereignty. Someone else will always make the final decision. This iron law of money is the case for an individual, a country or indeed a city, which brings me to Dublin and its financial autonomy. Dublin is by far the biggest source of revenue for the State. In total, €22 billion in tax was raised in Dublin in 2017. This represents 56 per cent of the State’s total tax take, despite having only an estimated 38 per cent of the country’s population. Dublin accounts for 61 per cent (€7 billion) of VAT receipts; 52 per cent (€8.5 billion) of PAYE/USC income tax; 45 per cent (€1.1 billion) of self-employed income tax; 62 per cent (€5 billion) of corporation tax receipts, and 43 per cent (€360 million) of capital gains tax receipts. While Dublin generates €22 billion in revenue, only €16 billion of this is spent in Dublin. Despite generating all this tax revenue, Dublin can’t raise one cent for itself or its own initiatives. It has no control over its own finances and therefore Dublin local government needs to go cap-in-hand to central government and the Dáil, dominated by representatives from outside Dublin who raise their hackles at large, necessary infrastructure projects for the capital, arguing that money is being “diverted” to Dublin, when the opposite is the case. As a consequence, Dublin is emasculated. It has no means to finance itself and all its ambitions are dependent on central government, which is loath to concede commercial power to the city over its finances. As a result, Dublin’s infrastructure is creaking, our housing problem persists and deteriorates and, most importantly, the buck stops with no one. There is a way to solve this and it is through issuing a Dublin municipal bond or a DMB. The bond would be a long-term IOU issued by a revamped Dublin City Council under the auspices of a directly elected mayor with executive powers. This is a common way of financing a city. The Nordic countries encourage their cities to raise green-bonds. These are issued to cover specific environmental initiatives such as cycling lanes, new transport investments or the roll-out of green buildings and homes. In the US, local and city governments raise their own money through the issuing of municipal bonds backed by city taxes to finance city-specific infrastructure. Once the city has a pot of its own money, raised from its own citizens, it becomes answerable to its own citizens, thereby strengthening local government enormously. The mayor of the city becomes a financially significant individual, and the process of breaking free from central power begins. The first way to decentralise is to decentralise the budget. In the US, local government has issued $249 billion (€218 billion) worth of municipal bonds in the first nine months of the year. There are more than 50,000 different state and local government authorities’ issuers. An average of $442 billion (€388 billion) in new municipal securities was issued per annum over the past decade. This money is used to pay for large-scale public investment such as roads, hospitals and schools. The overall size of the US municipal bond market stands at roughly $3.85 trillion (€3.38 trillion) – that’s about nine times Irish gross domestic product. The biggest owner of municipal bonds in the US is average households, accounting for roughly $1.6 trillion (€1.4 trillion) or 42 per cent of outstanding municipal bonds. We could do what the US does and give significant tax benefits to these bonds. Interest payments from municipal bonds are typically exempt from federal income taxes if you are resident within a given issuer’s jurisdiction. So, if you live in New York City and hold a local municipal bond, you can enjoy a steady stream of tax-free interest payments. Imagine the take-up of a Dublin bond from the estimated €90 billion on deposit in Irish banks, yielding nothing. In the US, aside from the obvious appeal of muni bonds associated with their various tax exemptions for residents, they typically offer an attractive yield, comparable to high-grade corporate debt, but with a better credit rating. A Dublin municipal bond could trade anywhere within the European monetary union. These would soon be liquid securities, attracting traders as well as investors. In fact, given the tax base in Dublin vis-a-vis the rest of the country, a DMB would have a higher credit rating than an Irish government bond. This would give the city ample scope to raise money. It is not hard to see how raising a Dublin bond would be good for the city and Irish investors. The annual interest on the bond could be paid by property taxes, rendering income generated from excessive Dublin property available to the rest of the city in infrastructural projects. This economic logic slams into the political rock of Rothschild’s observation about money and power. Is Ireland’s hyper-centralised system of government ready to set Dublin free in a world where cities, not countries, are in competition with each other for companies, talent and capital? I’m not sure the rest of the country is ready for this – more’s the shame. This idea has definite merit. There are very many examples of this model working in Europe and further afield. 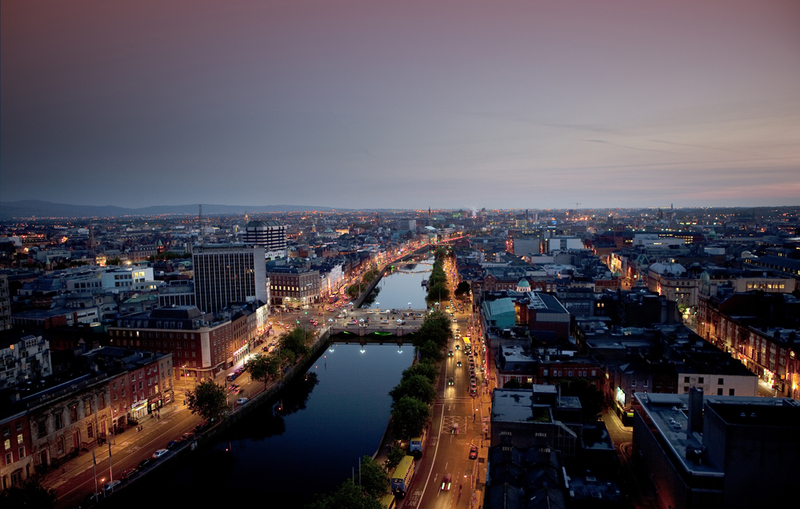 Dublin city competes with numerous cities overseas and it is important for Dublin to have investment so that it can compete on an international level. If Dublin could raise its own finances, this might free up capital for investment from central government in other areas of the country. However, there will always be an effective subvention from the capital to other areas, where providing services such as broadband requires more investment. An interesting one. This requires a fundamental recasting of the role and powers of a local authority. Debt raising has been the preserve of national government. This again requires powers to devolve from the centre to local level. The cost is hard to quantify. It is important to ensure that Dublin debt would not cost more to raise than national debt. And this requires a guaranteed income flow to make repayments. Local property tax would be one source, but more revenue raising powers would need to devolve to Dublin as well. The idea of local people investing in bonds from their local area is interesting. Would the benefit outweigh the cost? It would all depend on the efficiency of raising the money and of spending it. It is unlikely to fly politically in a country where Dublin is already seen as getting the bulk of the economic recovery dividend. But some way needs to be found to address the huge investment deficit in Dublin more quickly. This idea focuses on new financial resources. Many cities issue bonds successfully, so there is good evidence on how this might work in Dublin and there is expertise nationally (in the National Treasury Management Agency, for example) that could be drawn on. But the first step is to have the right projects for funding and Dublin City Council is starting from a very challenging place, given the boom/crash/boom sequence since 2000. Assuming that the right projects were identified, the cost of implementing this proposal should not be significant. I know you are just trying to stimulate debate, but, it is my personal view that the flaws of your argument are both numerous and potentially very costly. For instance, past performance, cost of appropriate human resources to govern, natural justice, and, hard logic. OK I’ll take the bait – someone should have told government the story of Rothschild before joining the Euro. The same logic could be used on a socio-economic basis. Travellers produce how much of the power-state’s tax revenue. And Travellers get how much in return for welfare. Given that an unusually high proportion of Irish Travellers live in Midlands towns like Portlaosie, Navan, Athy, Tullamore, Atlone, Tuam, Ballinasloe, surely these towns and their respective counties should be cut off from the tax revenue collected east of Leixlip ? A Municipal bond backed by Dublin’s politicians…..what could possibly go wrong ? Maybe CIE (Continual Incompetence, and Excuse-making) should issue their own bonds ? That would make far more sense. Even the CIE management have standards of crediblity. The politicians dominating local politics in the 4 Dublin local authorities are amateurs even on their better days. I know I joked about it before with you, but due to the extent of the housing crisis, traffic problems and crime in Dublin, I think it’s time we consider a devolved government for Dublin possibly in a federal Ireland, I’m not sure anymore if a Directly Elected Mayor will cut it! You did not mention the home tax which was supposed to finance municipal services. If Dublin had the use of its home tax it would not need bonds. So after 25 years (or 30 even) of slaving to pay off the crippling debt to a bank to own a crappy house you then get hit up by a new extortionist -the state. Property tax is an abomination. It means you never own your own home. If you don’t pay they will ultimately take your home by force and sell it out for under you to extract their cut that they demanded with menaces in the first place. So much for private property and the free market. Deco gets it spot on. A directly elected mayor, in the Irish context, is just jobs for the boys and their cronies. Cities issuing bonds successfully is the easy bit, it’s like politicians making promises. How many cities went bankrupt in the states, presumably because they didn’t fulfil their obligations regarding the bonds, a bit like not keeping promises. Even from very beginning of the State. I disagree with some of what the interviewee says. Well – if we can survive the Borgia’s, Napoleon and Hitler then Pope Leo V.2 should not be a problem. -> BUT DO WE NEED MORE OF THAT? Have you lost your logical, critical thought process? it ever developed? Have you lost your children to the beehive minded matrix? The oldest money is still good money.